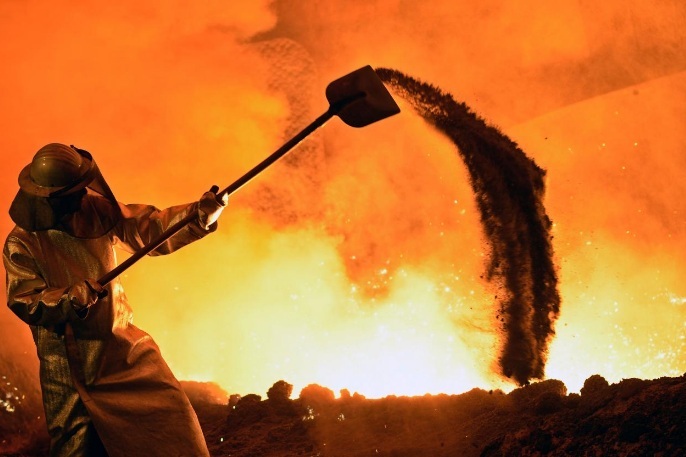 FILE PHOTO: A steel-worker is pictured at a furnace at the plant of German steel company Salzgitter AG in Salzgitter, Lower Saxony, Germany on March 21, 2012. BERLIN - German industrial production jumped more than expected in August, posting its biggest monthly increase in more than six years, data showed on Monday, in a further sign that Europe’s biggest economy is set for solid growth in the third quarter. Industrial output increased by 2.6 on the month in August after edging down by 0.1 percent in July, data from the Economy Ministry showed. That was the strongest monthly gain since July 2011 and easily beat expectations in a Reuters poll for a 0.7 percent rise, surpassing even the most optimistic estimate. A breakdown of the data showed factories churned out more intermediate goods, capital goods and consumer goods in August. Energy output also rose while construction activity fell. Data published on Friday showed that strong foreign demand, especially from clients outside the euro zone, drove a bigger-than-expected jump in industrial orders in August. German industrial production jumped more than expected in August, posting its biggest monthly increase in more than six years, data showed on Monday, in a further sign that Europe’s biggest economy is set for solid growth in the third quarter.